Riot’s been teasing out a ton of changes it’s making to its ludicrously popular multiplayer game League of Legends this week. 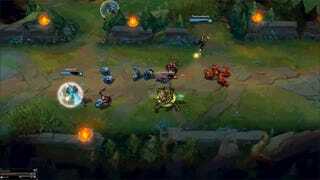 The biggest by far impact powerful ranged offensive units, known alternatively as “ADC” or “marksman” characters. Sounds like the bottom lane of League’s map is about to become very...different. The marksman changes are similar in intention (if not in practice) to the “juggernaut” changes that Riot made to four of League’s beefy melee champions earlier this year. In both cases, Riot said that its gameplay updates were designed for two objectives. First, they wanted to liven up champions who were either at risk of becoming stale and outdated in League’s current ecosystem—something that company is constantly battling against, given the fact that it’s playable character pool now has a whopping 120-plus champions and is only getting bigger. Second, they hoped to bring certain champion’s in-game abilities and stats closer in-line with a champion’s sense of character, thematically and aesthetically speaking. Riot’s already detailed changes it’s planning for 12 different marksman champions, and there could very well be more, so I’m not going to make any strong judgments until all of the reworks make their way into the main game. But a few tweaks have already started to stand out for fans. Take Jinx, for instance. She’s a ranged champion who wields a machine gun that can morph into a rocket launcher with the press of a button. Change Goals: Playing up what it means to Get Excited! as a path to success through a teamfight.Slowing down Rockets’ Attack Speed so there’s some tradeoff she incurs more of a tradeoff with that weapon. 1. Graves’ attack is a cone of 4 bullets whose AD ratio scales up by 33% over game time. The first bullet does 0.75-1.1 tAD (by level); extra bullets deal 33% of that. Each bullet can apply On Hit Effects, but only once per target. Graves’ crits fire more bullets (8 normally, 10 with Infinity Edge), empowering him at close range to burst a target and long range to deal AoE damage. 2. Graves stores two shells at any time. After using them, he will reload before he can autoattack again. Reload has a longer delay than the normal time between attacks and is reduced only slightly by attack speed. Graves’ time between attacks otherwise is reduced dramatically by attack speed. 4. Unlike other basic attacks, Graves’ bullets hit the first unit they collide with. As someone who’s played a ton of Graves games over the 2015 League of Legends season, I’m both intrigued and a little scared by these changes. Giving an extra oomph to Graves’ shotgun blasts sounds cool. But Graves has also already suffered for having shorter (and slower) attacks than many of his fellow marksman. Amplifying these aspects of his character could risk expanding his pre-existing weaknesses. Change Goals: Restore Urgot R’s defensive steroid function later in the game so that he doesn’t get wrecked so hard by all the percent penetration floating around out there. Ideally, this would make it easier for Urgot to immobilize enemy targets in team fights so his teammates can wail on them...and also be able to keep himself alive for longer in the process so said wailing can actually take place. Those are just three of the dozen champions being altered by this update. Changing that many characters at once is bound to be very interesting, to say the least. The marksman changes are just coming to League’s public beta environment, and I’m planning to test them out there over the next few days.